1.2 What is a muscle tonic? 1.3 What are muscle tonic preparations used for? 1.4 How is a muscle tonic prepared? 1.5 How to preserve muscle tonics? What is a muscle tonic? Muscle tonics are those preparations which are used to restore proper muscle tone. A muscular tonic allows the muscles regain their strength or stamina to work normally. What are muscle tonic preparations used for? Such preparations are used to retrieve the tired muscles and relieve pain. Tired muscles because of sports or long walks, etc..
How is a muscle tonic prepared? Medicinal plants with muscle tonic properties: medicinal plants which are prepared, usually in the form of infusions or decoctions, help restore muscle tone. Essential oils with tonic muscle properties: The essential oils are used in massages for plant properties dissolved in oil can reach the muscles. 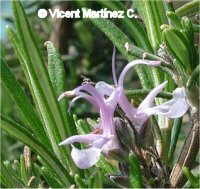 Rosemary is very soothing and relaxing. Infusions of the dried flowering tops can relieve pain. Similarly, if you add a handful of dried plant in the bath, it can relax and relieve you. How to preserve muscle tonics? More information on other types of tonics and medicinal plants.